A new elite skin for Rainbow Six Siege has been leaked. The Doc elite skin, Trench Medic, takes Rainbow Six’s resident medic back to World War One (although admittedly his gear remains something a little more akin to the modern-day warfare that defines Rainbow Six Siege). The leak stems from Rainbow Six Siege YouTube channel R6S News, which has regularly revealed new elite skins in the past. 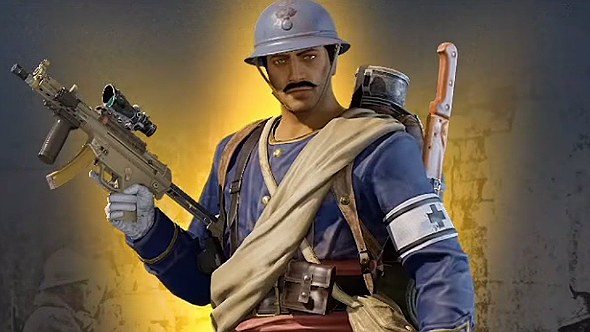 Doc’s elite skin is the blue worn by French forces throughout World War One (blue uniforms were used by the French army until 1935) determining that his new skin is definitely inspired by that particular conflict. He also wears an Adrian helmet, which was worn by French troops from 1915 onwards. A particular highlight is Doc’s dashing new moustache – a definite improvement on his usual and slightly eerie surgical mask. To highlight his role as a medic, Doc also sports an armband on his left arm. Rainbow Six Siege is an excellent tactical shooter, but why not check out our list of the best FPS games on PC? Doc is, admittedly, not one of the best Rainbow Six Siege operators, but he certainly has his uses, and the community has been asking for an elite skin for the character for a while in the run-up to the next expansion. Speaking of, Operation Para Bellum is on the TTS server now, so why not check out our Para Bellum tips? The expansion brings two new operators. Maestro offers a bulletproof surveillance camera to help allies spot their opponents, while Alibi’s Prisma device can be placed around the map to create decoy holograms. There’s also a new Rainbow Six Siege map, Villa, which, unsurprisingly, takes the operators to a beautiful villa in the heart of the Italian countryside, to fight in the home of a mob boss.